Close Writing is a project that wants to explore our textured life through writing. We want to create a space in which contributors from all disciplines and backgrounds can come together to investigate, complicate and question the affects, repercussions and lived experience of texture. For each salon, we will give a texture accompanied by some prompts, and ask our contributors to respond to it through writing, image, or sound. We will then share our work at a relaxed, critical reading salon, the first will be held in late Spring/early Summer (location and date tbc). Our first texture is sticky. What does it mean to feel something sticky? Why is a sticky surface so repugnant but simultaneously so alluring? What does it mean for thoughts, ideas, or bodies to stick together? Below are some writing prompts that circle around the subject of sticky that you can use if you wish. Please send your sticky writing as an attachment to closewritingsalon@gmail.com by the 29th April, labelling the attachment with your name and the title of your work. It can either be a finished piece of around 1300 words or in draft stages. Please also include a bio. Once we have selected we will get back to you to arrange our first reading salon. JAWS are currently seeking submissions for their forthcoming issue, the deadline for which is Monday 7th May 2017 (please see attached). JAWS is primarily aimed at MA and MRes level but also welcome submissions from PhD and BA students. The journal is published by Intellect Books – style guide is available here. JAWS are also recruiting peer reviewers and would love to hear from any students who would be interested. I would be very happy to send out any past issues or answer any questions students may have about the process. Dr Trudi Tate, the reviews editor of is interested in hearing from PhD students who may be able to write occasional reviews for the journal. 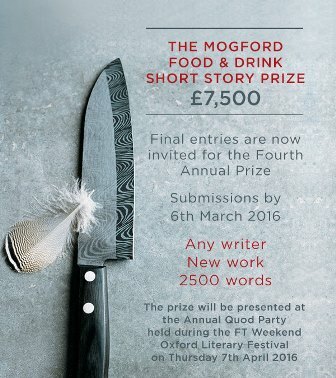 Final entries are now invited for the Fourth Annual Mogford Food & Drink Story Prize – £7,500. The short story can be by any writer, must be new work and a maximum of 2500 words. Submissions by 6th March 2016. The prize will be presented at the Annual Quod Party held during the FT Weekend Oxford Literary Festival on Thursday 7th April 2016.